In this part, we will explore the meaning Dhyana Shlokas 6 and 7. This section will conclude the review of the Dhyana Shlokas and we will progress to the main Sahasranamam from the next section. These two Shlokas share a common theme i.e. 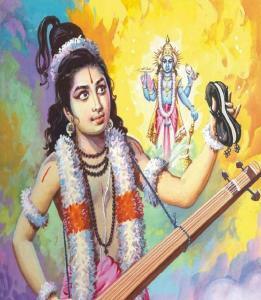 ‘Krishnam Aashraye’ meaning “I take refuge in Lord Krishna”. Parijata tree has a special significance. It is a compact tree bearing beautiful fragrant flowers, with snow-white petals and a red stalk. This flower blooms only at night and drops off from the tree before sunrise. 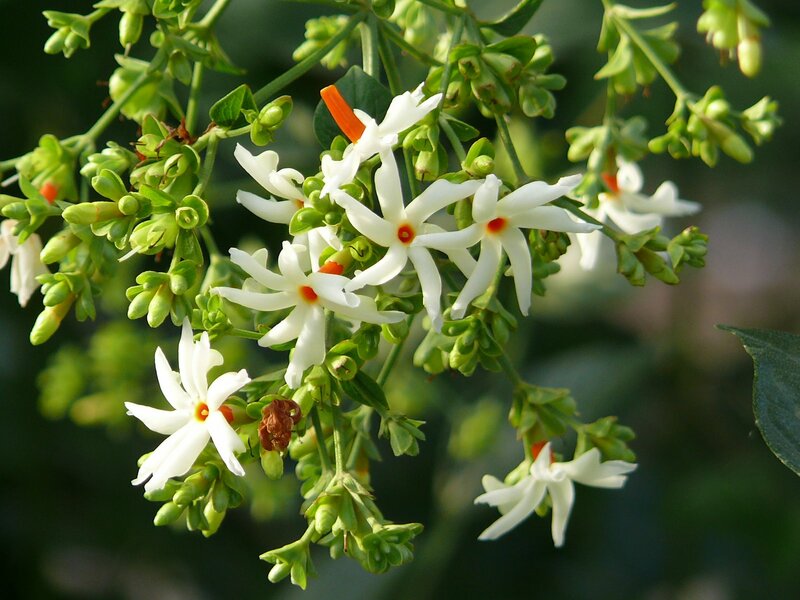 Belonging to the family Oleaceae Jasmine, the scientific name of the plant is Nyctanthes arbor trislis, with only a single species to the genus. Nux in Greek is light, anothos is flower, arbor is tree and tritis is sorrow. Together, the words mean `night flowering tree of sorrow’. The flowers have their medicinal values, Its dried flower is a good lung tonic and Broncho-dilator. It is also used in the cough diseases. Extract of the leaves has good antimicrobial activity. Let’s look at some of the interesting myths associated with the tree and why it is called the flowering tree of sorrow! According to the Puranic stories, Princess Parijataka was in love with the Sun, but her love was not reciprocated. Due to the unrequited love, she committed suicide and the Parijata tree sprouted from her ashes. Since she is unable to bear the sight of her love during the day, she blooms only at night, and sheds the flowers as tears, before the sun rises. The myth goes on to say, that the tree sheds its tears on the touch of the first rays of the Sun! The fragrant flowers spread their fragrance in the entire area, during the day, as a sign of undying love for her lover, the Sun. 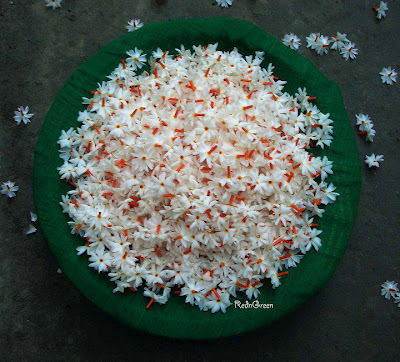 They are the only flowers which can be picked up from the ground and offered to God as good as freshly plucked from the tree! Another myth about Parijata tree has an interesting episode and according to this, the Parijata tree was in Indraloka (the abode of Lord Indra) which was one of the gifts received from the churning of the Milky Ocean to obtain Nectar and thus was a celestial tree, not available on Earth. Sage Narada, brought some flowers from Indraloka and gave them to Lord Krishna, and waited to see Krishna’s actions as to which of his two consorts would he give the flowers. Krishna gave it to Rukmini and she immediately took a great liking for the flowers. On seeing this, Narada went to Satyabhama and promptly told her about the incident. Needless to say, Satyabhama was overcome with jealousy and was seething with anger because of her possessiveness. Sage Narada gave her an idea and suggested that she should insist on Krishna to get the tree from Indralok and plant it at her home as a lasting solution. So, when Krishna came, Satyabhama was sulking and showed her anger and resentment. Krishna was perplexed, Satyabhama was accusing him of not loving her citing the flower incident and insisted that he get her the tree from Indralok or she will do a tapasya. Krishna relented and agreed to get the tree for Satyabhama to please her but was equally concerned about her desire to assert her superiority over the other consort. True to his nature, Sage Narada meanwhile went and warned Indra that some earthlings were out to steal the celestial plant from his Indraloka! 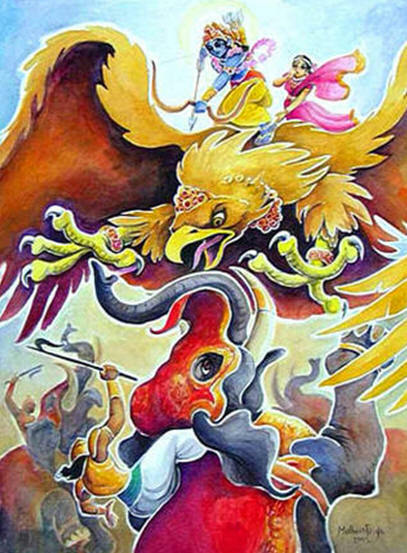 When Krishna and Satyabhama were about to leave after taking a branch of the celestial Parijata tree, they were accosted by Indra and a battle took place, leading to Indra losing the battle. But Indra would not let it go so easily, and cursed that the plant would never bear fruits, though it might bear flowers. Thus, the Parijata tree does not bear any fruit. Krishna planted the tree in such a manner that when the tree took height it developed a bend and thus all the flowers fell into Rukmini’s backyard. Though the tree was in Satyabhama’s house, the flowers would fall in Rukmini’s house! Well, Satyabhama wanted the tree and she got it and Rukmini wanted the flowers and she got it too! Satyabhama prided herself about the love Krishna had for her and her grasp over his heart. On one contrived occasion, Sage Narada arrived in Dwarka and in the course of conversation hinted to Satyabhama that the love that Krishna exhibits towards her is not all that real and in fact it is Rukmini (the first consort of Krishna) who has real control over his heart. Just like she had the tree but the flowers were enjoyed by Rukmini. Sage Narada, known for his way with words, tricked her into accepting a Vrata (ritual) where she had to give Krishna away in charity to Narada and reclaim him by giving the weight of Krishna in wealth. 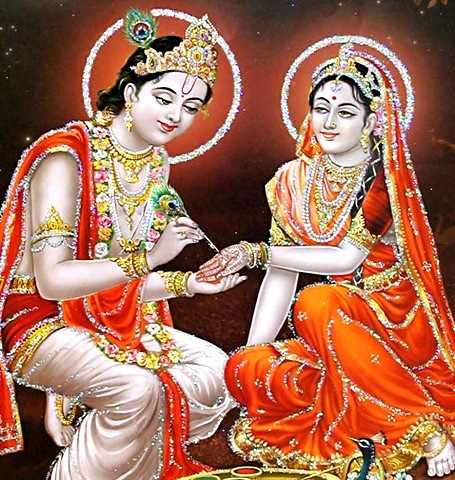 He told her that by performing the Vrata, Krishna’s love to her will increase many folds. And if she succeeds in performing this Tulabharam, he would forever be indebted to her. With Satyabhama’s ego duly raised, she told Narada that she can mobilize so much wealth that it is a child’s play for her to outweigh Krishna. Narada warned her that if she is not able to do this, Krishna will become his slave, to be done with as he pleases. Satyabhama gave Krishna away in charity (Daana) despite other wives’ pleadings. Krishna, always the mischievous cowherd, meekly submitted to this drama. After donating Krishna to Narada, Satyabhama arranged for a big scale to be put up and sends with pride for her huge treasure of gold and jewellery. All that she had was soon placed on the scale, but the scale didn’t tilt. Narada started taunting her and threatened her that if she can’t put enough gold or diamonds, he will be forced to auction Krishna as a slave to someone else. Satyabhama, in her frantic panic, swallowed her pride and pleaded all the other wives to give their jewels. They agreed out of love for Krishna but alas, it was of no use. Krishna remained a mute witness to all this drama and rubbed salt into the open wounds of Satyabhama’s ego that he has now to become a slave to some cowherd and will have to suffer the separation from his dear wife. Narada suggested to Satyabhama that Rukmini may be able to get her out of the predicament. She finally swallowed her pride and appealed to the devout Rukmini. Rukmini prayed to her Lord and put a single leaf of the sacred Tulsi (Thulasi or Tulasi) on the weighing scale (tula). Lo and behold, the scales tilted and came into balance at once and even after removing all the jewels, the scales remained even with the Tulsi leaf on the other side. 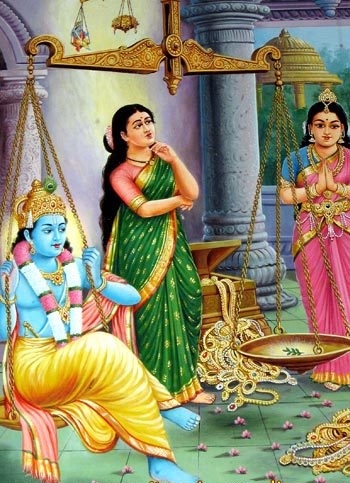 The story of the Tulsi leaf placed by Rukmini was worth more in weight than that of Satyabhama’s wealth is repeated to illustrate the significance of Tulsi and how a humble offering with true devotion, commitment and love for God is greater than any material wealth and or precious offering to God. AmbudaShyaamam – Ambuda literally means water-giver namely a cloud. So AmbudaShyaamam means someone having the dark blue colour of rain-bearing cloud. We have already seen phrases like ‘MeghaVarnam’ and ‘MeghaShyaamam’ in other Shlokas. AmbudaShyaamam is another poetic equivalent of the same aura. Aayataaksham – Aayata means long and wide. Aksha means eye. So Aayataaksha is someone having beautiful eyes which are long and wide. We have already seen phrases like ‘KamalaNayanam’ and ‘Pundareekaayataaksham’ conveying similar impressions. Alamkritam – means someone who is carrying various adornments or Alankaaraas. We have seen that Lord Vishnu is AlankaaraPriya, someone who loves ornaments and decorations of every type, Silk Attire, jewellery, garlands, perfumes and body marks – all these are part of Alamkaaram. Lord Vishnu enjoys all of these and therefore He is Alamkrita. Chandraananam – He has a Moon-like face. While comparing His face to the Moon the reference is not only to the beauty of the Moon but also to the cool rays emanating from the Moon. When the devotee looks at His face, the devotees agitation disappears, a calm appears in their face and they regain their composure. ChaturBaahum – He has four hands. We have already seen before ‘Namaami Vishnum Shirasaa Chaturbhujam’ in the previous DhyanaShlokam. In the main Sahasranamam, we will also see the line ‘ChaturMoortis ChaturBaahus ChaturVyoohas ChaturGatihi’. ShrivatsaankitaVakshasam – His chest is carrying the beautiful mark called ‘Shrivatsa’. We have already seen in detail the origin of the Shrivatsa mark on the chest of Lord Vishnu (Sage Bhrigu Story). 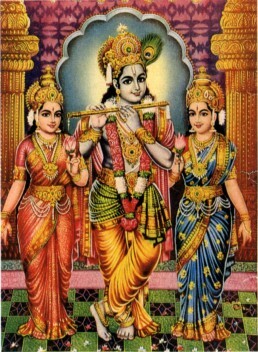 RukminiSatyabhamabhyaam Sahitam – He is accompanied by His two consorts Rukmini and Satyabhama. Even though Krishna had other consorts these two were the principal queens. There are interesting stories on Krishna’s marriages to Rukmini and Satyabhama. Bheeshmaka, the King of Vidarbha had two children, Prince Rukmi and Princess Rukmini. Rukmi wanted his younger sister to marry Shishupala, the crown prince of Chedi. Rukmini had heard stories of Krishna’s valour from her childhood and she had her heart set on marrying him. When she heard that Rukmi had chosen Shishupala for her, she resolved that she would only marry Krishna or die. She sent for her trusted aid Sunanda, a wise old Brahman. She wrote a note to Krishna telling Him that He was the only husband for her and asked if He would come and take her away. She had mentioned in that note that if He wouldn’t have her, she would give up her life. She had written that on the day of the wedding, she would go to the temple of the Goddess Parvati (their family deity) and if He would, then that was the right time for Him to take her away. She sent Sunanda with the note to Dwaraka (Krishna’s new fortress home). Krishna had heard a lot about Rukmini’s beauty too and longed to have her. On receiving the message from her, He resolved to carry her with Him. Krishna went to Vidarbha to get his brother Balarama, and embarked on his journey followed by His army. On the wedding day, when Rukmini was leaving the temple, she looked in the crowds for Krishna. She did not see Him. As she was about to step on to her chariot and leave, she felt someone hold her from behind. It was Krishna. 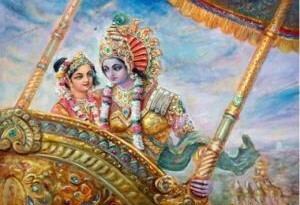 He lifted her into His chariot and sped away followed by Balarama with the army. Rukmi managed to go through Balarama’s army and caught up with Krishna and Rukmini. He swore that he would not return to his city without his sister. There was a furious battle between Krishna and Rukmi. But Rukmi was soon overcome but his life was spared by Krishna at Rukmini’s request. Krishna returned to Dwaraka with Rukmini and made her His consort. King Satrajit was the owner of the Syamantaka jewel. Satrajit, secured the jewel from Surya and therefore never wanted to part with it. Even when Krishna, wanted to borrow it he refused to give it to him. After some time, Prasena, the brother of Satrajit went out hunting wearing the jewel but was killed by a Lion. Jambavan, the bear, killed the lion and gave the jewel to his son to play with. When Prasena did not return, Satrajit accused Krishna of killing Prasena for the sake of the jewel. Krishna, in order to prove his innocence, set out in search of the jewel and found it in Jambavan’s cave, with a child. Jambavan attacked Krishna thinking him to be a trespasser who had come to take away the Syamantaka jewel. Both of them fought non-stop for 28 days. At last Jambavan’s whole body was horribly wounded from the thrashing of Krishna’s fists. Jambavan finally recognised Him and surrendered. 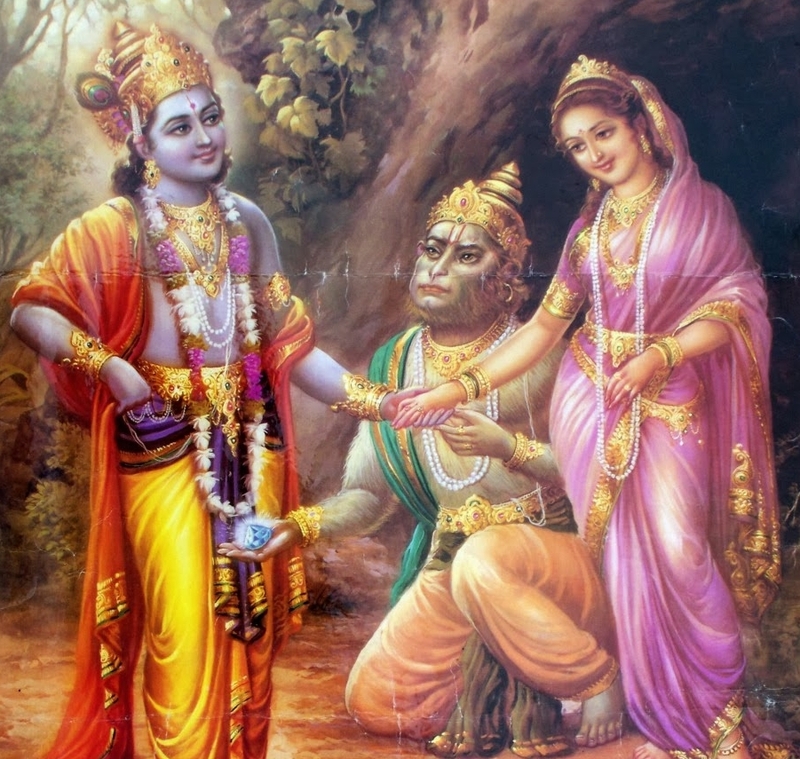 As a remostration Jambavan gave Krishna the jewel and humbly offered his daughter Jambavati’s hand in marriage. Krishna then returned the jewel to Satrajit, who repented for his allegation. He offered Krishna the jewel and also his daughter Satyabhama in marriage. Krishna accepted Satyabhama’s hand but turned down the offer of the jewel. Beautiful explanation Sridhar and Balaji. I loved the heart wrenching story of Parijata… So much love & devotion. Rukmini & Satyabhama’s love which is eternal & bountiful… & the moral that a humble offering is more important than mere materialistic wealth. Krishna had heard a lot about Rukmini’s beauty too and longed to have her## Krishna never longed to have anyone. In fact Rukmini had met Krishna when he had come to pay respects to Bhishmaka and fell madly in love with him. He did not reciprocate. She continued to send letters to him, he did not reciprocrate. Only when Rukmini had resolved firmly that she would give up her all herself to Krishna or else give it up, at that brink of the moment when she was about to immolate herself is when Krishna takes her as his wife. The message we need to imbibe is that to get Krishna, one has to completely absolve our ego and throw ourselves upon His mercy. Satrajit could not tolerate the rising popularity of Krishna and hence deliberately sends the Syamankataka with Prasena to the jungle. Blames Krishna that he has stolen the jewel. When Krishna sets out alone, Satyaki wanted to follow him; but a local goon wanted to kill Satyaki. Satyabhama comes to know iof this plan, kidnaps Satyaki, and they both go in search of Krishna. The rumour spreads that Krishna has not only stolen the Syamankata and Satyaki has eloped with Satyabhama. They get attacked by wolves and get separated in the melee and she has nothing but a thin cloth to cover her modesty. Krishna find them and soon al;l three are caught in the world of bears. After the fight with Jambavan, Jambavan realises who Krishna really is. 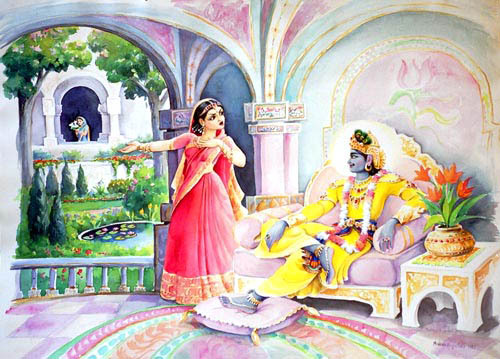 Jambavati is slated to marry a cruel bear king whom Jambavan does not like and requests Krishna to marry Jambavati and take her away from the bear-land. Krishna, Sathyambama, Jambavati and Satyaki pass by trial of Adishesha and come back to Dwaraka with the Syamantaka. I have recently planted a parijatam plant in my terrace garden .waiting for it to start flowering , never realised that there will be no fruits in the plant . Beautifully described.the consequences of being in love and being in egoistic love..Both Rukmani and Satyabhama loved Krishna in their own way.and had prjudice for hm.. They wer some what correct also on their part. But these stories depict the false imagination of true lovw with one being.. Krishna is.im mortal. He can be.ones when worshiped with true love and dedication..
Nce wrt up sridhar and ur co author. U both are grt. Wonderfully described. Thanks for the stories of Krishna as well. The inclusion of related myths made it very interesting!